This article seeks to present a new and comprehensive cosmology as seen from an LDS viewpoint, but using the best of non-LDS sources for greater understanding. Cosmology is defined as “the study of the origin, evolution, and eventual fate of the universe”, but in religious terms it is more properly an understanding of how man, god and religion fit into the origin, purpose and destiny of the human soul within the universe. 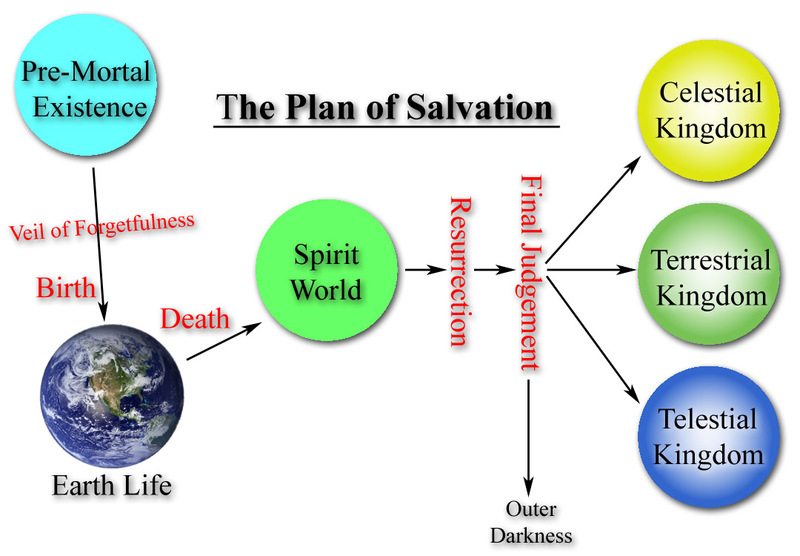 LDS people call this “Eternal Progression” within The Plan of Salvation. Joseph Smith’s view of eternal progression added a lot to the existing cosmology of Catholicism and Medieval Christianity, but the many works cited in this paper add immensely to the general LDS view, and may clear up some contradictions in the prevailing LDS view of the afterworld. This article is under construction. Check back for updates! 1. Our Solar System has an orbit within our galaxy much like our planet orbits our sun. This orbit brings us through many varying energy densities which essentially control the progression or evolution of our planet and its inhabitants. The progression of mankind and people individually cannot be fully understood outside of the context of of physical cosmology–because they are synchronous. 2. The fractal (micro/macrocosm) or law of relative relationships is the key to understanding ourselves, our earth/ solar system, galaxy and the universe. The majority of ancient and esoteric cosmologies seek to use symbols to typify the fractal patterns of our galaxy–patterns existing in the respective levels of; the atom, the human body, the planet (body), the solar (body) and the galaxy. The patterns are often summarized in the religious use of the numbers 1,2,3,7, & 12 and their corresponding shapes (sacred geometry). The religious use of these numbers & symbols loosely summarizes very complicated concepts of physics which govern the major divisions of our earth & galaxy. Thier use also serves as a pattern or outline to understanding cosmology. 3. The number one. One symbolizes the Father; the universal natural law or the infinite & intelligent unifying field which unites all matter and intelligence in our galaxy and the universe. This all encompassing principle which Hebrew religion called “The Most-High God” & His Power/Spirit. Many high beings seek to mimic and speak in the name of this highest principle. Differing religious systems use different words and concepts to explain this symbol of first cause… but agree that it is the all-highest, eternal or first created principle of intelligence in the universe. 4. The number two. Two symbolizes the fundamental duality of the aforementioned unity (or “The Father”). Relative relationships of this duality include corporality & spirit, seen & unseen, positive & negative, masculine & feminine, father & son. Every atom and inhabited body (planet, sun, etc) in our galaxy contain this duality; which we will call physical and spiritual dimensions– a visible, particle-like core and an invisible, wave-like energy shell. In the case of bodies large enough to house consciousness these are the planetary body, and its electromagnetic field wherein non-incarnate intelligence dwells. 5. The number three. The Trinity/Godhead, symbolized by the Father-Mother-Son or Father-Son-Spirit or three realms of glory, etc. Each of two aforementioned dimensions naturally tend to separate into three divisions each, which we will classify as quantum levels, “kingdoms”, “realms” or “glories”. A few physical examples of these divisions are the three states of matter and the three electron orbitals (not counting ground state). Most modern Christian descriptions of heaven use this pattern to divide the heavenly regions of the earth. The LDS three degrees of glory spoken of in D&C 76 dualistically speaks of these divisions. Although classifications vary greatly, each earth and each heaven or spirit word contain these divisions. 6. The number seven. The seven archangels, dispensations or Elohim. On a much greater scale, the galaxy contains seven divisions of energy/light which we will term as densities, “glories” or progression levels. 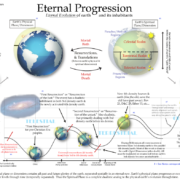 Every sphere in the Galaxy (planet or sun) progresses up and down through these levels sequentially. The seven periods or energy levels of the atom are a fractal of these states. Density boundaries are equivalent to the Hebrew and Christian “harvest” seasons and described in greater detail by Hindu and Buddhist cosmologies. Also symbolized by the Elohim, Archangels and creative periods. Some uses of LDS Telestial, Terrestrial and Celestial glories seek to represent levels three, four and five of these seven divisions. As an example of how these divisions pertain to earth and mankind, we could summarize by stating the earth has two dimensions; the material world we live in and the spirit world which houses our consciousness when we die. Each of these dimensions tends to divide into three somewhat arbitrary divisions or glories. As the earth and its heavens orbit the galactic core (along with all their inhabitants) they progress through the seven energy densities, evolving/progressing from a state of lower/fragmented intelligence into what are often classified as gods, higher beings or unified planetary consciousness/intelligences. The various terms such as ‘heaven’, ‘resurrection’, ‘god’, ‘celestial’, ‘angel/archangel’ used by mystics and religion to explain these divisions and processes can be very confusing and misleading for reasons we will explain. Is Religious Cosmology Man-made or Revealed? The implications of this on the idea that man is alone in the universe should be obvious. Could mankind really be the only advanced life in the multiverse? Does anyone really believe there are not sophisticated civilizations which exist in the heavens or other dimensions, watching over, protecting, and studying us on our evolutionary journey of self determination and progression? Isn’t it probable that advanced life in our galaxy looks at earth’s inhabitants with the same pity, compassion and respect for self determination, as our technologically advanced world looks on these aboriginal tribal groups? Uncontacted primitive tribe living in Brazilian rain forest photographed in 2010 (red & black is body paint). Many such groups exists which are totally unaware of the advanced world around them. In the following article I suggest that most of the world’s religious and scientific advancement is very likely result of inspiration passed to man from advanced extra-dimensional groups in the heavens. These groups seem to have carefully and subtly worked within our superstitions and religious traditions to telepathically pass information which might help us individually and as a planet to one day join the galactic community–without frightening us or violating our right to self-determination. However, because of the contradictory aspects of channeled/revealed literature and near-death experiences, it also seems evident that any such interaction happens in a subjective metaphysical realm where the cultural beliefs and expectations of the individual are strangely meshed with completely unique and new information which seems to be passed to them. Such ideas might seem a bit crazy… but then again you might think about what the aboriginal people in the above pictures thought when they tried to tell their friends about their unbelievable encounter with a low-flying helicopter. LDS people like to talk about the law of witnesses spoken of in 2 Cor. 13:1 which says that “in the mouth of two or three witnesses shall every word be established”. I believe this common-sense concept applies to all truths revealed to man by higher dimensional groups. The highly organized, and strictly governed groups in the heavens, which religion’s typically associate with “God”, subtly reveal truths through the subconscious of witnesses to each respective class of people on earth according to their existing traditions and ability to receive offered information. So not only have heavenly truths been shown to multiple witnesses within Israel or the earth’s major religions but those heavenly truths are also revealed through multiple separate secular witnesses and thus on to the world at large. In Mormonism we call the religious witnesses, prophets, seers or revelators; although the generally accepted term in most of Western society for a religious witness is a “clairvoyant”, “channel” or “mystic“. As I have combed the world’s revealed texts for cosmological information, I have found a handful of works which have been especially helpful in piecing together a cohesive view which expands and makes sense of the piecemeal and often ambiguous descriptions of cosmology found in LDS scripture. In the last few decades it seems most modern individuals producing ‘revealed’ works have considered themselves part of the “new age movement”. One quite modern example was Don Elkins, whose strangely original works pioneered much of new age cosmology and like the Newbrough, Blavatsky and the Theosphical Society, did a fantastic job of harmonizing the worldviews of ancient eastern and western prophetic or mystic works. All of these individuals taught controversial cosmological concepts which are in many cases validated by modern consensus oriented scientific inquiry. All of these prophet/seers (called mystics in modern terms), claim to have been taught by light-beings or angels (or “Jesus” if this was their religious tradition), as well as seeing “heaven” and channeling large literary works. Works which give strikingly similar accounts of eternal progression, the constitution of heaven and a new theology—greatly advancing the prevailing ideas taught in Catholicism and medieval Christianity. Each of these individuals work’s mirrored larger cultural changes in social and industrial thought and development. By piecing together the evidence given by all their accounts, I’ll attempt to construct picture of the afterlife which seems to harmonize the views of many major earthly religions with each other as well as with scientific findings. And I believe that future consensus oriented scientific inquiry will eventually iron out the misconceptions and distortions of the world’s religious views and bring the world into a general unity of belief and understanding concerning the metaphysical realms and the ways in which higher dimensional being communicate in those realms. Like most large religious sects, the LDS church is typically a little narrow minded as to what revelations or prophets it accepts or believes. Because of this, LDS theology has not advanced much past the cosmological ideas of Joseph Smith and the early nineteenth century. In teaching our view of cosmology, LDS missionaries commonly use the above diagram, which although somewhat corresponding to the accounts of other modern mystics in a simplistic sense– ends up distorting the available picture of revealed Christian cosmology. It suggests that the degrees of glory seen in Smith’s D&C 76 revelation, are different spheres or planets of sorts, completely separate from earth or the spirit world to which men pass after corporeal resurrection. A careful reading of Joseph Smith’s revelations, in comparison to other given revelations shows this is not quite the case (we will cover this misunderstanding in detail much later). 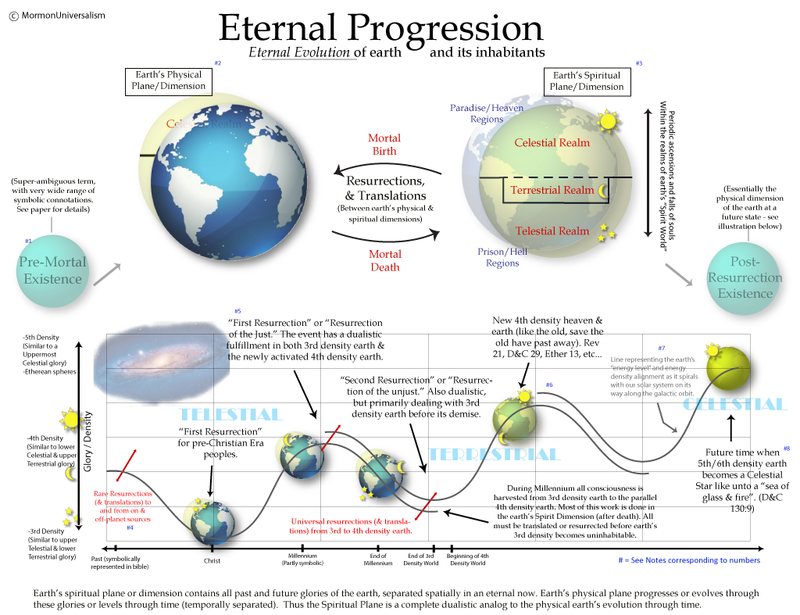 The illustration and prevailing view also ignores Smith’s view of earth’s future status as a “terrestrial kingdom” during the millennium, or the earth’s future status as a “celestial kingdom” (LDS Terms to be described later). The illustration also perpetuates distorted views concerning the ‘Spirit World’ being a two-divisioned, disembodied realm where the majority of people on earth wait for an extended period of time until the “resurrection”, which will occur at the beginning and end of the millennium (which again is a gross oversimplification.) I have attempted to create some diagrams of my own to better show the complexity of available revealed Christian cosmology. However, I have been met with frustration realizing that they will also inevitably introduce confusion and misunderstanding in people’s minds. It is simply too difficult to properly depict the complexity of the modern mystic accounts of dimensional divisions in pictures so I will try to draw on as many examples in physics as possible. Hopefully they will help people get at least one step closer to the picture of reality as described by the many witnesses. 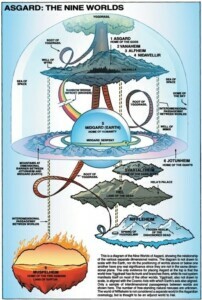 A less simplified view of LDS cosmology based on LDS theology. Events like the “fall, flood and second coming” are archetypes based on Judeo-christian worldviews which use partially mythological events to teach important symbolic truths. Comparison of Earth\’s nearly circular orbit around the Sun to Our Solar System’s more elliptical orbit around the Galactic Core in our Milky Way Galaxy. In reality the orbital path more resembles a serpent as it helically spirals or zig-zags above and below the galactic equatorial plane. Comparing this to what we currently know of our Galaxy, its not easily understood what Joseph Smith was getting at (or if this is a feasible astronomical model at all). But although this cosmological model may at first seem a bit far-fetched, it in fact has more witnesses to its general validity in both John Newbrough’s work and in Hindu and eastern cosmology. Just a few decades after Joseph Smith, Newbrough independently wrote a cohesive and highly illustrated cosmology consisting of our solar system orbiting through our Milky Way galaxy in a circuit, in his book Oahspe, A Sacred History of the Higher and Lower Heavens on the Earth. The differing worlds of dimensions of ancient Norse Cosmology. 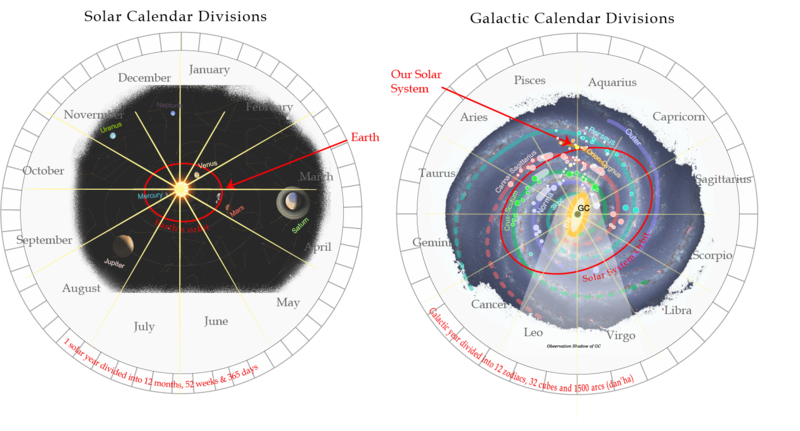 Illustration comparing the divisions of earth’s Gregorian Solar Calendar with the divisions outlined in Oahspe and ancient mythologies of the Galactic Calendar. These divisions are the ‘Times and Seasons’ mentioned in the Bible and the LDS D&C. 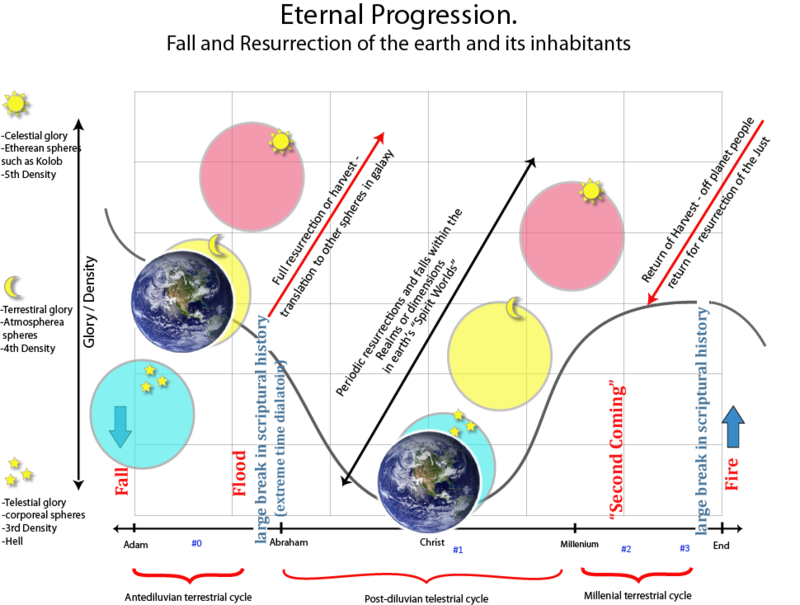 Just as the earth’s seasons are caused by our planets position in the solar system combined with our earth’s axial tilt, so also are solar seasons dependent upon our solar system’s position in the galaxy combined with our Sun’s ‘axial tilt’ and position in the galactic plane. Additionally, Oahspe and the Law of One suggest that as the earth travels through the Galaxy, it passes through regions with differing energy density, which actually affect the consciousness and intelligence of mankind in general. This concept linking energy or light in the galaxy with intelligence and consciousness of mankind is also taught in Mormonism in the Doctrine and Covenants. Oahspe and the Law of One go into far more detail on the specifics of how the intensity of interstellar cosmic energy reaching the earth affects human consciousness and behavior. It suggests that most ages of enlightenment as well as ages of apostasy and intellectual darkness are caused by the amount of intergalactic energy reaching our solar system. The Oahspe text contains many supposed ancient illustrations (channeled in 1882) of astronomic regions though which the earth passed in its galactic orbit which purportedly affected human behavior and consciousness, the pattern in this illustration (left) is surprisingly similar to the reinforced wave patterns of toroidal energy flow (right); a theoretical field pattern existing in the galaxy. The blue equatorial circle could very roughly symbolize our solar system’s orbit around the galactic core. Line nodes would represent reinforcing waves which create areas of high energy density. There are several other cosmic influence dictated by our position in the galaxy, explained in Oahspe’s cosmology which we don’t have time to cover in this article. These include the 11 year solar cycle affecting the ability to travel and communicate through space. There are many activities which can occur only with the collapse of the sun’s magnetic field during solar max (references coming soon). These cycles as well as regions of nebula and gas clouds also affect man’s ability in the spirit world to raise or be resurrected between realms or kingdoms (references coming soon). The realms or kingdoms of the spirit world are also raised or lowered depending on these galactic conditions (references coming soon).